There’s several sites I host for family and friends in addition to this site. It’s a mix of WordPress, Drupal, and static sites, all running on a Linux virtual host hosted by Rackspace. The Linux host is pretty old at this point, and really should be upgraded. Additionally, I wanted to give DigitalOcean a try as I can get a virtual server there for less. Although I kept the installations for each site pretty well organized in different directories, migrating them over the traditional way would still be time consuming and error prone, involving copying over all the directories and databases that are needed, migrating users, making sure permissions are right, and making sure to get any service scripts and configurations that need to come along. This is all a very manual process. If (when) I get something wrong, I’d have to troubleshoot it on the target server, and the whole process isn’t very repeatable nor version controlled. I wasn’t looking forward to it. While working on our Pilot product at Encanto Squared, a new tool came on our radar, Docker, which we adopted and greatly simplified and streamlined our deployment and server provisioning process at Encanto. Naturally, I decided to use docker to migrate my sites to another server, and to generally improve how these are being managed. The above diagram is inspired by this dockerboard tool. The tool works but the diagram required some style tweaking so I did it in OmniGraffle. Each of the rounded rectangles above is a separate docker container, and all of the containers are orchestrated by docker compose. The blue lines between the containers are docker compose links, which connect the two containers at a network level, and create an entry in the source’s host file pointing to the target container. Each docker container runs with its own network, layered filesystem, and process space. So for one container to be able to communicate with another it has to be specifically enabled, via links in the case of docker compose. I’m using this as a reverse proxy into the other docker containers. It has a link to each of the individual site containers to be able to proxy HTTP requests to them. This is a static site served up by its own nginx process. This image is based on the official WordPress image, with some additional packages installed. The official WordPress image uses Apache. This container maps the directory /var/www/html to /var/lib/cont/mfywp on the host to store the WordPress site files. Having the site files on the host makes it easier to backup and ensures any changes to the site survive a restart. I won’t go into the other WordPress-based containers. They’re essentially the same. This is the database for all of the WordPress sites. This container maps the directory /var/lib/mysql to /var/lib/cont/db on the host to store the database files so they survive restarts & can be backed up easily. It is running the official MariaDB Docker image. As mentioned above, all of this is managed by Docker Compose. Following is a portion of the Docker Compose configuration file. The WordPress-based site images are stored on a Docker repository. The proxy nginx image is built locally by Docker Compose. If you’re hosting your images in a private Docker repository, create a .dockercfg file on the server containing the credentials to your private Docker repository. Docker Compose will use this on the server when pulling the images from the Docker repository. If your images are all in a public repository, this isn’t needed. You can remove the .dockercfg after the next step to avoid having the credentials on the server. Everything should be running at this point. I haven’t converted over the Drupal sites yet, but the approach will be the same as the WordPress sites. The sites are independent of each other. I can install new and upgrade packages of one site without affecting other sites. I’m able to make changes and run the sites locally and test them out before pushing out any changes. Consider running the WordPress sites using a lighter weight process rather than requiring Apache. Maybe this isn’t a problem at all. But verifying almost every line of code with unit tests is very difficult, and I’ve rarely seen it done. Also, it’d be nice to get more immediate feedback of a syntax error, in the IDE/editor, even before running unit tests. Additionally, static typing serves as a form of documentation in the code, and enables IDEs to more accurately auto-suggest completions, which cuts down on the amount of time you spend looking up function and variable names from other modules. That’s not to say the answer is to only use statically-typed languages. There’s many benefits to dynamic languages and reasons we’re using them in the first place. Ideally, I’d like to have an optional typing system where typing can be specified where it makes sense, and not where it doesn’t add enough value or is impossible due to the dynamic nature of the code. Additionally, the system should be smart, using type inference to cut down on the amount of type annotations that need to be made. Another option is flow, backed by Facebook. Coming from Facebook, it has good support for React. Flow is a relatively new option, released in 2014, so doesn’t have as much of an ecosystem as Typescript and doesn’t have many type definitions for 3rd party libraries, although supporting TypeScript’s definitions is on their roadmap. Flow makes more extensive use of type inference, so it’s able to infer types and detect errors without requiring as much explicit type annotations. My project is starting with a significant ES6 code base. We’re pretty happy with ES6 as it is, so the main thing I’m looking for is to add type checking rather than a new language. Based on these factors, we decided to try out flow. In a future post I’ll write about our experience with trying out flow, and steps to adopt it into an existing codebase. The latest version of the Sculptor Generator is based on XTend 2, which is compiled to Java/Bytescode rather than interpreted as XTend1 and XPand was. This should bring large performance improvements to the code generation cycle, and it certainly feels faster for my projects. Of course, since code generation is part of the development cycle, we’d always like the performance to be better. In order to improve the performance, we first need to know what the bottlenecks are, which is where a profiler comes in; specifically I’ll describe using YourKit to profile code generation for one of the Sculptor sample projects. The first step is to start the YourKit profiler. 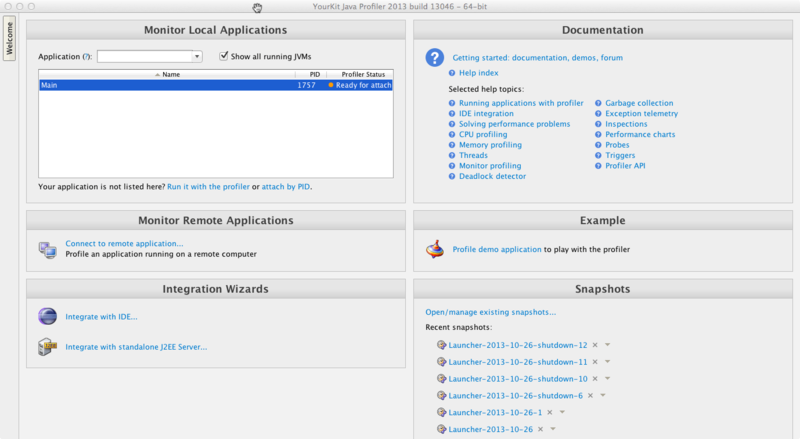 YourKit will start up with the welcome view, and will show any running Java processes, ready to attach to one of them. Now we need to execute the Sculptor generator, first attaching it to the YourKit process. 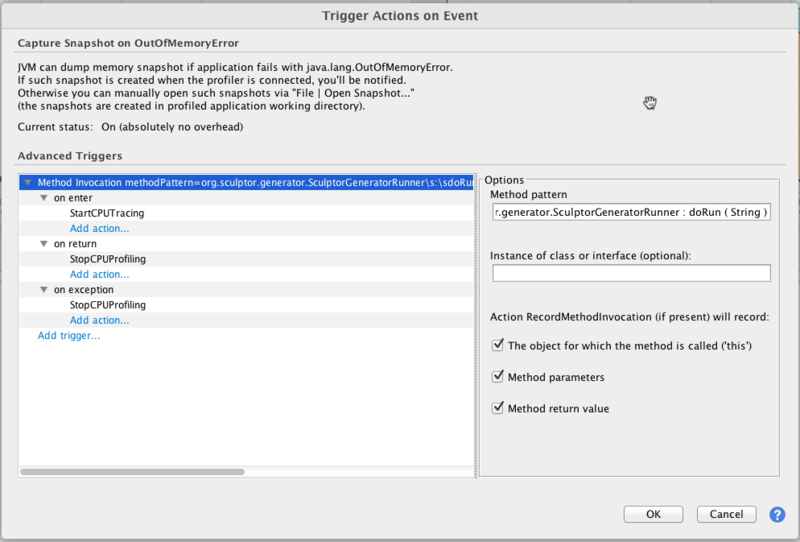 Sculptor code generation is typically executed as part of a Maven build, via the Sculptor Maven plugin. Since Maven isn’t a long-running process, and we want to make sure to profile all of the code generation cycle, the best way to attach Sculptor to Maven is to do it at Maven startup via JVM command line arguments. Specifically -agentpath to attach the process to YourKit and enable profiling, and YourKit startup options that can be used to enable different types of profiling, taking snapshots, etc. The above will enable the tracing profiling method (vs sampling), and instruct YourKit to record a snapshot that may later be inspected on process exit. 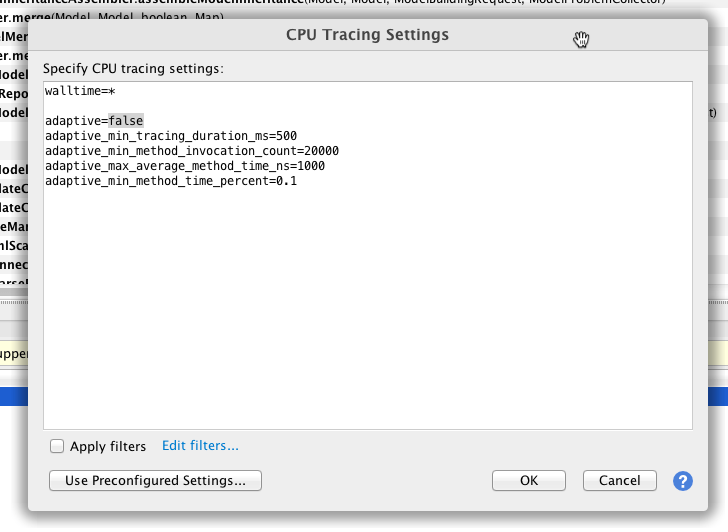 You can control how YourKit performs tracing via Settings -> CPU Tracing… The only tracing setting I changed was to disable adaptive tracing, which omits some small frequently called methods from profiling. This lessens the profiling overhead, but I’m not really concerned about that and want to make sure I’m getting complete results. These results are fine, but the trace results are cluttered with many methods we’re not interested in, since the entire Maven execution has been traced. The best option I found to only trace those methods we’re interested in was to initially disable tracing, then use a YourKit Trigger to enable tracing on entry and exit of the main Sculptor generation method, org.sculptor.generator.SculptorGeneratorRunner.doRun. 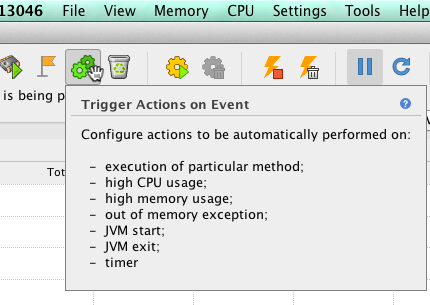 In YourKit, you can add a trigger via the “Trigger action on event” button. Following is the exported trigger configuration. The above steps are just a means to end up with this configuration, so you can skip them and simply copy the following into a triggers.txt file. A project I’m working on requires storage of and queries on Geospatial data. I’m using MongoDB, which has good support for Geospatial data, at least good enough for my needs. This post walks through the basics of inserting and querying Geospatial data in MongoDB. First off, I’m working with MongoDB 2.4.5, the latest. I initially tried this out using 2.2.3 and it wasn’t recognizing the 2dsphere index I set up, so I had to upgrade. MongoDB supports storage of Geospatial types, represented as GeoJSON objects, specifically the Point, LineString, and Polygon types. I’m just going to work with Point objects here. As you can imagine, 2dsphere is more accurate, especially for points that are further apart. In my example, I’m using a 2dsphere index, and doing proximity queries. First, create the collection that’ll hold a point. I’m planning to work this into the Sculptor code generator so I’m using the ‘port’ collection which is part of the ‘shipping’ example MongoDB-based project. Next, insert records into the collection including a GeoJSON type, point. According to MongoDB docs, in order to index the location data, it must be stored as GeoJSON types. The coordinates above, as with all coordinates in MongoDB, are in longitude, latitude order. Next, we create a 2dsphere index, which supports geolocation queries over spherical spaces. These are some (old) notes on my experience with looking for an easy Grails hosting solution. This is a continuation of this post where I explored Heroku for Grails hosting. Cloud Foundry is also a hosted service provided by VMWare, the principal company behind the Cloud Foundry platform. In addition to VMWare, several companies provide hosting services. How does Cloud Foundry stack up against my original requirements? 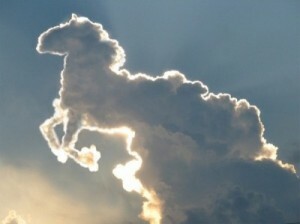 Cloudfoundry.com is currently free. Actually, they’re in a sort of beta mode, and there is no information on a non-free account. Currently the limits are 2 GB of memory and 2 GB of storage. The Cloud Foundry platform is open source (Apache License 2.0), and there are multiple providers as I previously noted, so check. Instances can be scaled up on-demand via their VMC command line utility. Cloud Foundry has excellent Grails support. Not surprising considering VMWare is behing both Grails and Cloud Foundry. The Cloud Foundry Grails plugin makes it easy to deploy, update, and overall manage your Cloud Foundry-based Grails application. This post is a good getting started guide. All of these are supported by Cloud Foundry as services. The getting started guide lists the available services (see left menu). Cloud Foundry supports HTTPS out of the box, but it sounds like that terminates at their load balancer, so communication between the load balancer and your instance is unencrypted. Not a big deal for me, at least when starting out. Other providers like appfog may more fully support SSL. I deployed my Grails 1.4 based app to cloudfoundry.com, using the MySQL and MongoDB services. It pretty much worked as advertised and was a breeze to get started with. I had to increase my instance’s memory limit from the default 512MB, but that was easy to do via VMC. I also ran into this problem with Grails and Spring Security on Cloud Foundry. The solution of adding the following to BuildConfig.groovy worked for me. I was running with Grails 1.4, so the latest Grails 2. * may not have this problem. This is the first in a series of posts where I’ll explore XText2 by porting an existing XText1-based DSL to XText2. The DSL to be ported is a GUI-description language based on the Sculptor DSL that generates Google Web Toolkit UIs using the Activities and Places framework. The first step is to set up a new XText2 project and prepare it to start adding elements from the existing DSL. 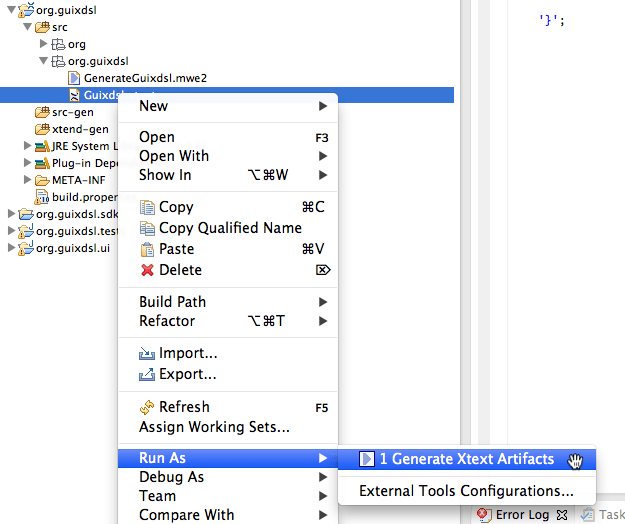 We can create the XText 2 project via the steps in the First Five Minutes Tutorial. The language artifacts, including the Eclipse editor, can be generated by selecting the Guixdsl.xtext file and selecting context->Run As->Generate XText Artifacts. The first time you generate language artifacts, the MWE2 workflow prompts you as to whether you want to download the ANTLR 3 parser generator (recommended), which it has to do due to a license conflict of some sort. Say yes and proceed. Once the language artifacts have been generated, we can take the DSL out for a spin by selecting the org.guixdsl project, and selecting context->Run As->Eclipse Application. This will launch a new Eclipse instance with our DSL plugins installed. 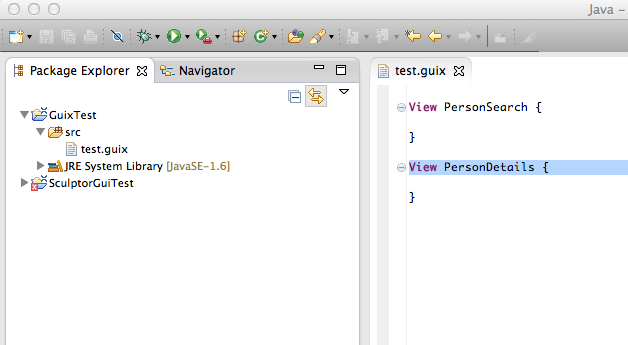 Once in the new Eclipse instance, we can create a new test Java project, and create a test DSL file in the project source folder. If you get a dialog that asks whether you want to add the Xtext nature to the test project, be sure to say Yes. I thought this was only needed to edit the language grammar or code generators. I found out the hard way that your custom code generator won’t get executed unless you have the XText nature enabled, but oddly enough, the JVM model inferrer will. But more about the code generator and inferrer below. We’ll come back to this test project throughout the development of the new DSL to test out different features. For now, we just want to make sure our minimal DSL and generated language artifacts worked ok.
One of the new features of XText2 is the ability to map DSL concepts directly to Java types, which XText then directly generates code for. This mapping is defined by implementing an inferrer class that extends AbstractModelInferrer. Of course, generating code via templates is still supported, and done by defining a class that implements IGenerator. When you create a new XText project, by default it’s set up to use the generator strategy rather than the inferrer. Our goal is to use both. 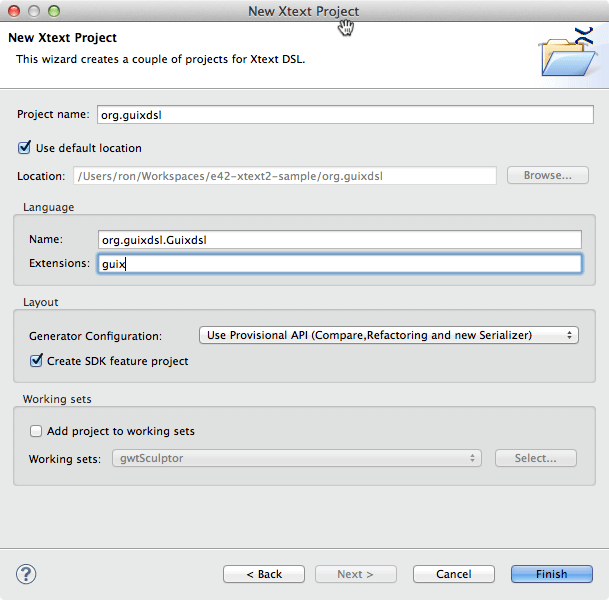 The existing XText1-based project uses XPand templates, which can be converted to XTend2 templates. At the same time, we’d like to start using the Java types inferrence approach for some classes. 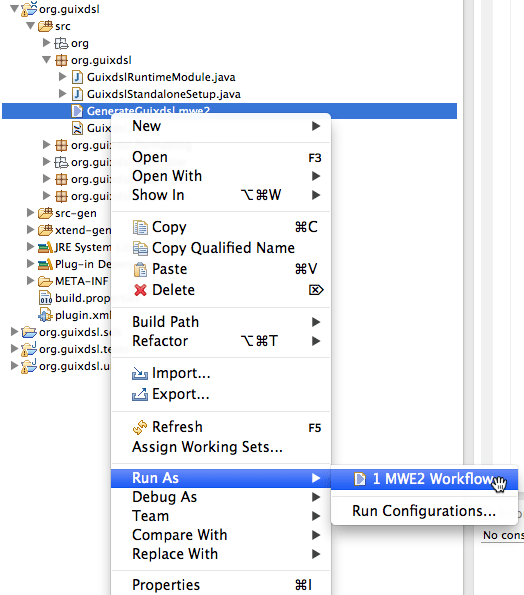 Run the GenerateGuixdsl.mwe2 MWE2 workflow to generate everything, including the code generation infrastructure, based on the DSL. * convenience API to build and initialize JVM types and their members. * given element's type that is contained in a resource. This works great, but switching to use the XBase base grammar caused the generator strategy to get disabled. For this DSL, we need to be able to generate some classes via JVM inference, and some via template-based code generation. Thanks to the this post on RCP Vision for info on this & how to re-enable the generator. What happened is XText switched the generator from our generator, GuixdslGenerator, to org.eclipse.xtext.xbase.compiler.JvmModelGenerator, which generates code based on inferred types. You can see the binding in the AbstractGuixdslRuntimeModule generated module in the org.guixdsl project where both the generator and the inferrer are bound. To re-enable the generator class, update the binding in GuixdslRuntimeModule, which extends AbstractGuixdslRuntimeModule and is generated only once (can be modified whereas AbstractGuixdslRuntimeModule cannot). Now the generator is back and getting invoked, but generation isn’t happening for any inferred types. This is because although the inferrer is getting called, the JvmModelGenerator is the class that actually generates the code, and we just switched it off above. We want to have both our custom generator, and generation based on inferred types. To enable both, modify our generator to extend JvmModelGenerator, and delegate to it. In a future post, we’ll add support for package definitions to the language, and start generating GWT code.